D When the original red brick Art Building sprung up along the west bank of the Iowa River in 1936, it signaled the beginning of a novel experiment. For the first time, practicing artists and art historians would study together under one roof, an approach that would be dubbed the "Iowa Idea" and become a national model. Eighty years later, the recent opening of the UI's Visual Arts Building ushers in a new era of artistic collaboration. After the flood of 2008 washed out the original building and forced the university to relocate its studio arts to a converted retail facility on the outskirts of town, the School of Art and Art History is unified again. John Beldon Scott, director of the School of Art and Art History, says the new building advances the vision of former UI President Walter Jessup and Graduate College Dean Carl Seashore, who first brought artists and history scholars together in the 1920s and 1930s. This is a pivotal year for the revival of UI's arts campus, says Scott, with faculty moving into the Visual Arts Building in May and the new Hancher Auditorium lifting its curtain this September. Additionally, two arts facilities are moving across the river: The School of Music will begin classes in its new glassy building near downtown this fall, and the UI Museum of Art recently announced a new east-campus site for future construction. The $77-million Visual Arts Building is the first to come online, hosting several summer programs before opening in earnest for the fall semester. The metal-clad building is itself an artistic marvel. 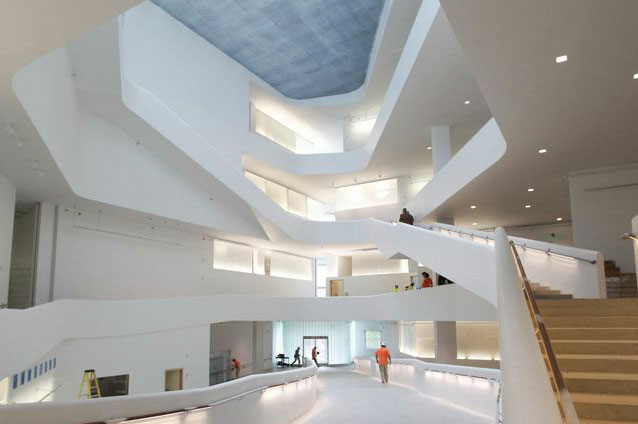 Designed by New York-based Steven Holl Architects—the same firm that designed Art Building West—the 126,000-square-foot facility provides loft-like, light-filled studios for artists in an array of mediums, from painting to pottery to 3D design. It also houses five galleries and a small auditorium. A dramatic, four-story atrium wrapped with stairs and ramps leads to naturally lit, open spaces designed to encourage collaboration and creativity. Meanwhile, the UI Museum of Art announced its latest plans in April after ending a public-private partnership that would have placed the museum in a new downtown development. Instead, the museum now intends to rebuild near Gibson Square at the corner of Burlington and Madison Streets, adjacent to the Main Library. Museum of Art Director Sean O'Harrow says not only will its proximity to the library draw in more students, it will also forge new ties between the museum and UI Libraries' Special Collections and Preservation and Conservation Department. "The whole idea is creating a new model for museums in the 21st century," O'Harrow says. "I've always believed museums and libraries are in very similar situations and have virtually identical missions in that they're resources for education and research."